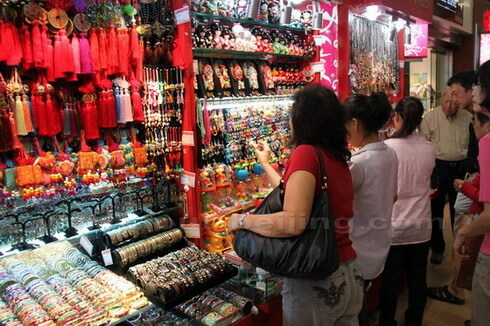 If you are a shop-a-holic, then you'll find shopping in China has a lot to offer, if you go searching for it. You may need to ask the right questions to find the kind of venue or experience you are looking for. Be prepared to barter. Learn some Chinese or take someone Chinese along with you. Tip: every place that you go to - ask for a business card. That way, the next time you want to go there, you can simply show the business card to the taxi driver. It makes life much easier and you gain a lot of personal independence. In China you can easily buy wallet size business card holders. I kept all my business cards in this, in my handbag, and was able to go anywhere I wanted to go without asking for help or someone to translate for me. In China, everywhere is downtown. It is not like the west, where we separate the single-family dwellings from the business and shopping areas. In China, on the ground level, is store after store after store of small privately owned shops. Every neighbourhood has it is own market. In most cities in China, and in Hong Kong, products are usually found grouped together in districts. So if you wanted furniture, you would go to the furniture district. If you needed office supplies you would go to the office supply district. If you needed fabric, you would go to the fabric district. There is usually a specific downtown area where you will find at least one main department store and a market. In the department stores, you pay the price shown on the ticket. There is no bartering. Department stores are very generalized, carrying everything from shoes to appliances. They will have a lot of products – but maybe available in only one style or one color. When you make a purchase – it is generally not returnable. There is seldom a guarantee. There are no fitting rooms to try on clothes. Women go shopping with a tape measure and generally just know their size when they see it. There is a lot of fake stuff for sale in China, so the Chinese tend to trust a department store just a little more than a local retailer – for purchases of value – like a cell phones, name brand watches, TVs or computers. However, even department stores can be selling fakes. I thought I was being safe by paying about $100 Canadian for a brand name watch in a big Chinese department store. However, about a year later, the casing for the watch was totally tarnished. I had better luck with $5.00 watches that could be bought on any street corner. My husband bought a very expensive cell phone from a large retailer, only to find out it was fake and that the battery only lasted one day at a time. Shopping in China has it's high moments when you find a bargain and low moments when you realize you've been cheated. Downtown Shanghai has an export market that is full of knock-offs at fantastic prices. You can buy high end knock-offs and low-end look-a-likes. The high end knock-offs you pay much more for – but the quality is good and it is quite difficult to tell if it is real or not. I purchased Channel leather wallets and Tommy Bahama’s shirts at ridiculous prices and they were very good quality products. In the large coastal cities like Shanghai, Beijing, Guangzhou and many others, you will find high-end malls with brand name retail stores. Hong Kong is full of these high-end glitzy malls. Most larger cities also have a walking street of shops – which is always a favourite place to spend several hours looking for a bargain. In Shanghai,Guangzhou and Shenzhen, there are several export markets, where you can find things produced for export, but not generally found in the Chinese shops. Here, things can be bought at wholesale prices. Fabric markets can be huge – some several acres in size – servicing the garment industry. It is not usually open to the general public and purchases made in the market are usually made by the bolt. However, if you go there and act like a foreign buyer, you can tell them you are making samples and need only a few yards. They will usually allow you to buy. My husband owned a garment factory – so I had a business card from his factory printed up for myself. When I showed my business card, they were always helpful. You can design your own business cards for just a few dollars in China – and voila – suddenly you are a fashion designer shopping in the world’s largest selection of fabrics! Then you take your fabric to a tailor to have it made into whatever you choose. The tailor needs only a picture – they require no pattern to work from. They simply take your measurements and can give you what you want. For most of inland China – most of the grocery shopping is done at the local market as opposed to the supermarket. The local market is dirty, wet and full of stalls selling everything from fresh local vegetables, homemade tofu, and eggs, to live poultry and dogs ready for slaughter. There are also lots of dried medicinal type foods available. You won’t find a nice sliced pork chop or a roast here. You might buy a whole chicken, and the stall owner will take his cleaver and chop it up into a hundred pieced for you so it is ready for you to cook in your wok – with head and feet in a bag on the side. Beef comes ready cooked as a small roast that sliced and added to noodles or stir-fry dishes. The Chinese like fresh food, so they shop daily for their immediate needs.